As a dad, when I’m reflecting on the meaning of life these days, I’m often reflecting specifically on the impact my actions and words will have on my kids’ lives. How will you be remembered when you’re gone? And what difference will you have made? It’s a gloomy and somber thought in a lot of ways, but it’s impossible to avoid forever. At the end of the day there is nothing more important than our relationships with the people that we love - and how we can provide a little magic for their lives. What’s the meaning of my role as a dad? Of course parents need to show their kids love and keep them safe. But there are two other responsibilities I’ve often stated that I think sum up my role. First of all, I think it’s immensely important that we as parents pass on a set of priorities and give our children the tools to basically be good people. Be kind to others. And, second of all, it’s our job to stoke the fires of our kids’ imaginations and to inspire them to endlessly seek out the beauty in life. That’s why I’m such a big fan of sharing beautiful art - like picture books - with our kids. I really enjoy art that lends itself to multiple viewings. I enjoy books and movies that you can read or watch multiple times, and you always seem to discover something new and walk away with a little more meaning. For me it’s a sure sign that a lot of passion went into the project. But, more than anything, I really love it when the meaning you’re slowly uncovering in the art coincides with powerful feelings and emotions. I’m talking about meaning of life kind of stuff - love and loss and what it’s all about. 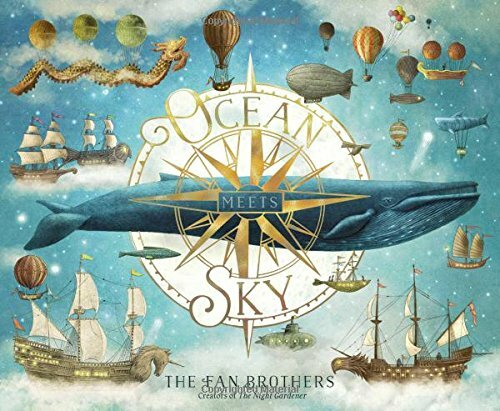 The Fan Brothers (Eric and Terry Fan) recently came out with a picture book that does just that - Ocean Meets Sky. These very talented artists have quickly become family favorites in our house. We will eagerly get our hands on anything they come out with. Their books consistently envelop me with the type of beauty and mystery and imagination typically found in a Chris Van Allsburg book - and I love having those feelings. In Ocean Meets Sky, a young boy named Finn has recently lost his grandfather, and today would have been his 90th birthday. As I mentioned before, this is the type of story that works really well with multiple readings, because plenty of things need to be discovered. But we can tell very quickly that Finn had a special relationship with his grandfather, and he fondly remembers his stories about a magical place where ocean meets sky, and how they would go there together one day. In Finn’s memory we get a snapshot of Finn with his grandfather telling his stories, and a look of wonder on the boy’s face. Finn decides to build a boat to take the journey they had planned together - to the place where ocean meets sky. If you pause for a moment just to think about that, it’s enough to make you cry already. This sweet boy is literally building a boat on his late grandfather’s birthday to travel to the imaginary land they used to talk about together. Suddenly, the realization comes crashing down on you that the strange, magical journey the boy is experiencing is not nearly as random as you may have thought. While he’s working, he falls asleep inside the boat, and he wakes up to find out the journey has already begun. He’s already in the middle of the ocean, surrounded by clouds that make familiar shapes in the sky. He’s on his way to where the ocean meets the sky, and he sees incredible things along the way. The imagination and talent of the Fan Brothers really shines during this journey. There’s a flying whale, a giant goldfish, an island of books, a sea of moon jellies, and much much more. The artwork is mesmerizing. And it’s full of secrets to discover. After you read it once, go back and look very closely at the early picture of Grandfather’s study and you’ll see many objects that the boy sees on his journey - the golden fish, the jellies, the toucan, the pipe, and much more. Suddenly, the realization comes crashing down on you that the strange, magical journey the boy is experiencing is not nearly as random as you may have thought. It’s very specific and very deliberate. He’s very clearly visiting his grandfather. He’s working through every single one of the beautiful little things he remembers about him, and all of the stories he ever told him to bring magic into his life. This sweet boy is literally building a boat on his late grandfather’s birthday to travel to the imaginary land they used to talk about together. All of Grandfather’s stories took place where ocean meets sky. That’s where the magic is. That’s where your imagination can take you. I love that concept. Like the horizon, we don’t even know if it really exists or if it’s even reachable, but that’s where the magic is. And how do we help our kids get there? Finn’s grandfather made a lasting and memorable difference in his life. He built up his childlike wonder and gave him magic - just like we should all do for our own kids. He was the magic in his grandson’s life. How are we going to be remembered when we’re gone? I hope, like Grandfather, it’s as the source of the most beautiful dreams. Ocean Meets Sky was our favorite picture book of 2018 - have you read it with your family yet? Tell us your own thoughts in the comments!